I'm thrilled to be hosting Poetry Friday this week! I'll do my best to keep up with all the posts and adding them here but be sure to check the comments. 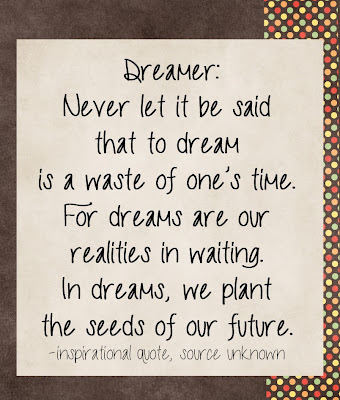 This year in my school district our superintendent asked us to think about our dreams for our students and to keep our dreams in mind and alive in every facet of our work. I really love the idea of dreams. I totally agree that if you can dream it, you can achieve it. 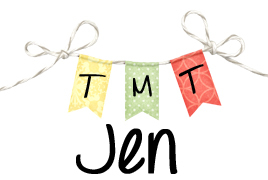 Today I'm sharing two of my favorite poems about dreams and one of my favorite songs, The Rainbow Connection from The Muppet Movie. Thanks for checking out Poetry Friday this week! When I was in 2nd grade, everyone in my class had to choose a Shel Silverstein poem to memorize and recite to the class and our parents. My friend and I tag-teamed Sarah Cynthia Sylvia Stout! I'll never forget that poem - I don't remember every word after all these years, but I do remember loving that poem and all of Shel's other poems. 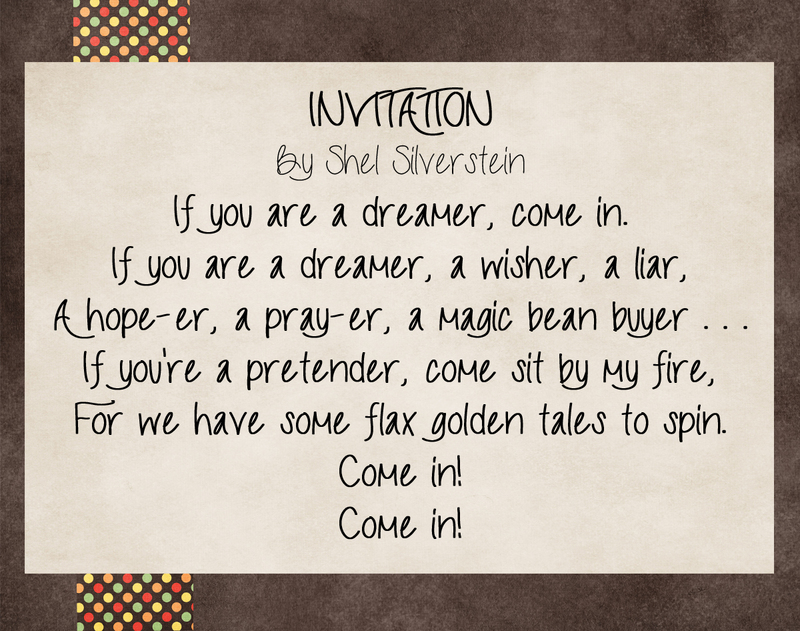 Invitation is at the beginning of Where the Sidewalk Ends and to me it's such a wonderfully welcoming poem. I love stories, I love read alouds, and snuggling up on the couch or listening to an audiobook. I love everything about listening to stories and imagining being friends with the character, off on an adventure or solving a mystery, wondering what it might be like to walk in their shoes. 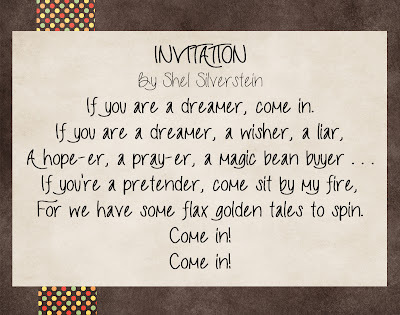 Dreaming and imagining are so magical and Shel Silverstein does such a great job of capturing all of that in this poem. I saw this quote on Twitter and I tried to find out the original source but I just couldn't trace it back to anyone or anything. What I love about this quote though is the emphasis on the idea that one little dream - something completely fantastic and out of the ordinary - can grow into something bigger and something that might mean a better tomorrow. It reminds me of the novel The Dreamer by Pam Munoz Ryan which is based on the life of Pablo Neruda. 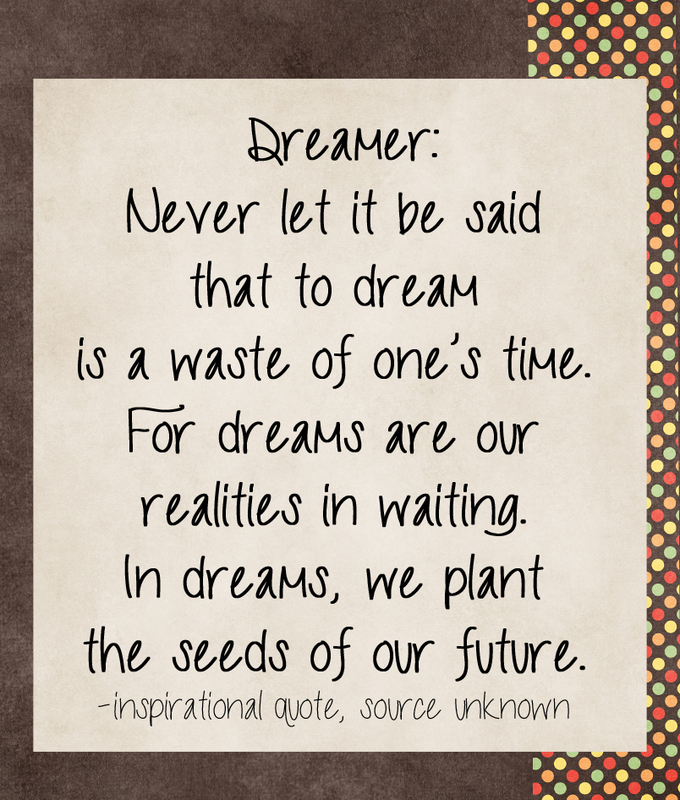 Pablo Neruda would have definitely be considered a dreamer. While his father didn't truly seem to recognize or accept how remarkable Pablo Neruda was, others did and he did have such a tremendous impact on literature and poetry and the arts. Not everyone dreams in the same way. Some are able to imagine a dream and go after it while that doesn't come so naturally to others...but we need any dreams we can get! I'm excited to read everyone's posts this week! Hooray for Poetry. Be sure to add your link and if you're on Twitter, use the hashtag #PoetryFriday. Laura from AuthorAmok is hosting YA verse novelist, Holly Thompson, today to talk about her new book "The Language Inside." She even has a gorgeous new hardcover copy of the book to give away! Linda Baie at Teacher Dance shares an original poem about believing in the work we do as teachers. At Random Noodling, we have an original poem called "Sliding Pon." Kurious Kitty shares two small poems from More Pocket Poems. KK's Kwotes has a quote by Mollie Hunter. Tara is celebrating Roald Dahl Day over at A Teaching Life. From Charles: The new Poetry Minute org with Poems, Activities and Lesson Plans. He also posted 10 Things I've Learned as a Children's Author at the FATHER GOOSE Blog. And is sharing the Love of Reading and Writing at the BALD EGO blog. Myra from Gathering Books has a museum for monsters this week for Poetry Friday with Marilyn Singer and Gris Grimly. BJ at Blue Window shares an original poem today: a parody! Joy from Poetry For Kids Joy shares the poem WHERE WILL YOUR POEM GO? and includes a poetry prompt. Tabatha shares The Hunting of the Snark by Lewis Carroll. Greg from Gotta Book shares an original today - Book Review: Anti-Gravity. Renee invites us to watch a poetry video of her theater poem "Opening Night" from THE POETRY FRIDAY ANTHOLOGY FOR MIDDLE SCHOOL. It's all about the jitters and the glory! Catherine from Reading to the Core shares two stanzas from Laurence Binyon's "For The Fallen" today. Michelle doesn't have to apologize but she does, telling us that she doesn't have positivity today on Today's Little Ditty. She's showing her "dark side" with an original limerick inspired by Friday the 13th. I say write/post what you feel! Jama is sharing a poem from Barbara Crooker's new poetry book, GOLD. Betsy from I Think In Poems offers a poem inspired by some old words pasted into Tagxedo and new words inspired by the word cloud that resulted. Heidi from My Juicy Little Universe invites us to join in with a weather experience and a poem from PFAMS. Mary Lee from A Reading Year is sharing a (draft) original and the determination to reclaim her daily writing habit. Go Mary Lee! Amy from the Poetry Farm offers up an original poem about gathering acorns, something she did while waiting with her children at the bus stop earlier this week. Sounds like fun! Laura Purdie Salas is back to Poetry Friday with a quick first draft of a haiku based on a news article from this morning. Liz shares a poem entitled, "Your Neighbor" which was inspired from earlier in the week when she got locked out and wandered the neighborhood while waiting for the locksmith. Keri from Keri Recommends shares a draft of poem inspired by the weekly prompt from Poets & Writers and someone she saw yesterday. Matt has a poem he wrote I wrote about the first day of school! Violet offers an original poem about being in harness again, it's called "Fall Semester". JoAnn from Teaching Authors posted a new monarch poem, along with a favorite blog post from a Teaching Author Alum and info about International Dot Day. Pam at Mother Reader shares her songs-as-poetry series, today she features "Wake Me Up". Anastasia from Poet! Poet! has an original haiku about fall. M. M. Socks has an original poem to share called, In Momma's Shoes. Samuel put up 5 new poems on his doodle blog. He also wrote an article about the construction process of most of his poems. Jone shares The Library by Sara Holbrook. Bridget from Wee Words for Wee Ones has an original poem of what it must feel like to be a carnival pony entitled, "Clip Clop". At Semicolon, find a Poetry Friday post about Emily Dickinson and a YA novel featuring Emily as protagonist and detective, Nobody's Secret by Michaela McColl. Lorie is contemplating weddings from this summer. Here's haiku Grown Children at On Point.